Please note that blogs are public and can be read by anyone on the internet, including any comments that you may make. For private discussions with AFHK Members' only please join our Forums. Thanks Celine Joly ! Was great to see you, Lea and Teo. We're happy that you enjoyed your time and thanks for sharing this cute video. Happy Holidays! Bid at AFHK Silent Auction and treat yourself with Exclusive La Mer products starting 50% below retail value! Every year at our Annual Family Holiday Party, we hold a raffle and a Silent Auction to raise funds to help us sustain and grow our continuing pre and post adoption education support and outreach work. This year, a kind donor has given us the following renowned genuine La Mer products, considered to be some of the world's best and most exclusive beauty treatments and we decided to open our Silent Auction to bidders who are unable to attend in person. Winners will be announced at the Holiday Party on December 13 and those not in attendance will be notified by email by December 20. Last year, with your generous support we raised nearly HKD16,000 which was a remarkable result but we are hoping to do even better this year. We look forward to receiving your bids! Thank you for playing a part at AFHK. 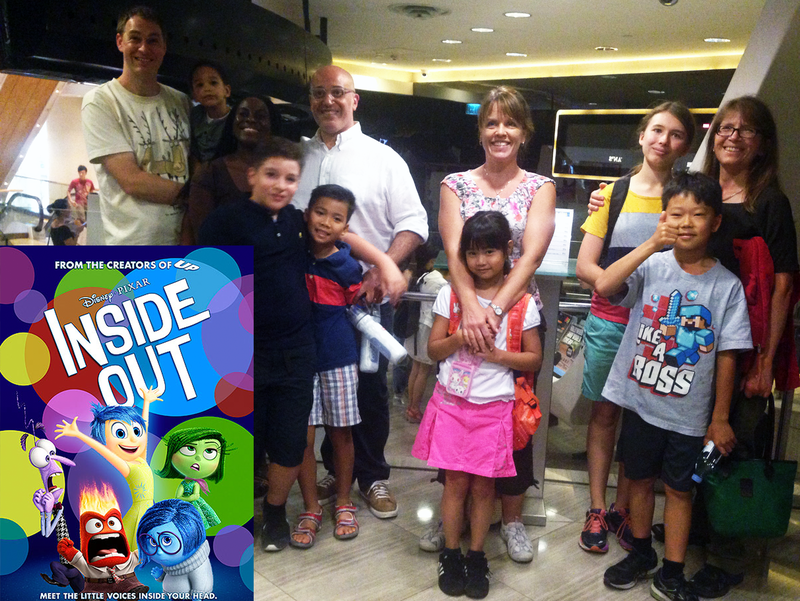 Inside Out proved to be a great movie for all ages and especially for the children! In our first "AFHK Meets at the Movies", the children learnt that it's ok to feel all types of emotions and that even sometimes you can feel multiple emotions at once. Some memories can be happy and sad, as we learnt from the characters Joy and Sadness. We would thoroughly recommend this movie for all adoptive families! 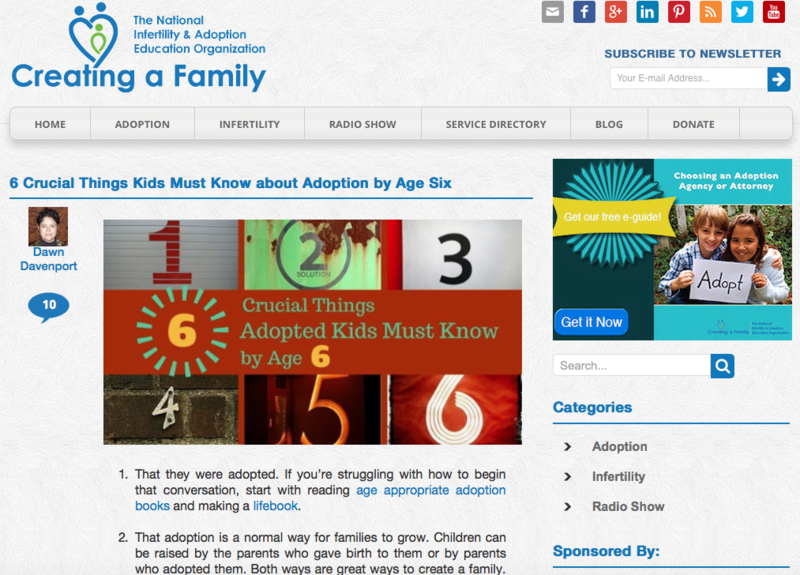 Many parents dread having the “adoption talk”. They worry that they will make a mistake; that their child will feel different; that they will somehow burden him with information he does not need to know. Worry not! “The Talk” is really a series of small seemingly inconsequential talks as your child ages, starting before they even understand the words and continuing until they are adults sharing these 10 basic facts. Adoption is normal. Families are formed in different ways and all ways are great. All children are born to a mommy and daddy. Adopted kids need to know that they grew in their birth mom’s tummy (uterus) just like other kids grew in their mom’s tummy. Suzy and John (birth parents) were not ready to parent any baby when you were born. We think your birth parents were very very poor and knew that they couldn’t give you what you needed. Their adoptive parents wanted them very much and were very happy when they came. Their adoptive parents will have enough respect and compassion to not talk disrespectfully about their birth family. Their adoptive parents are always open to their questions and to help them get more information. It’s OK to have mixed emotions about being adopted. It’s OK to love both their adopted family and birth family. Their adoptive parents will tell them their full adoption story and not keep secrets from them about their adoption. Family secrets are destructive. Lay the groundwork for the full story during the younger year and aim to have shared the full story no later than around age 12. 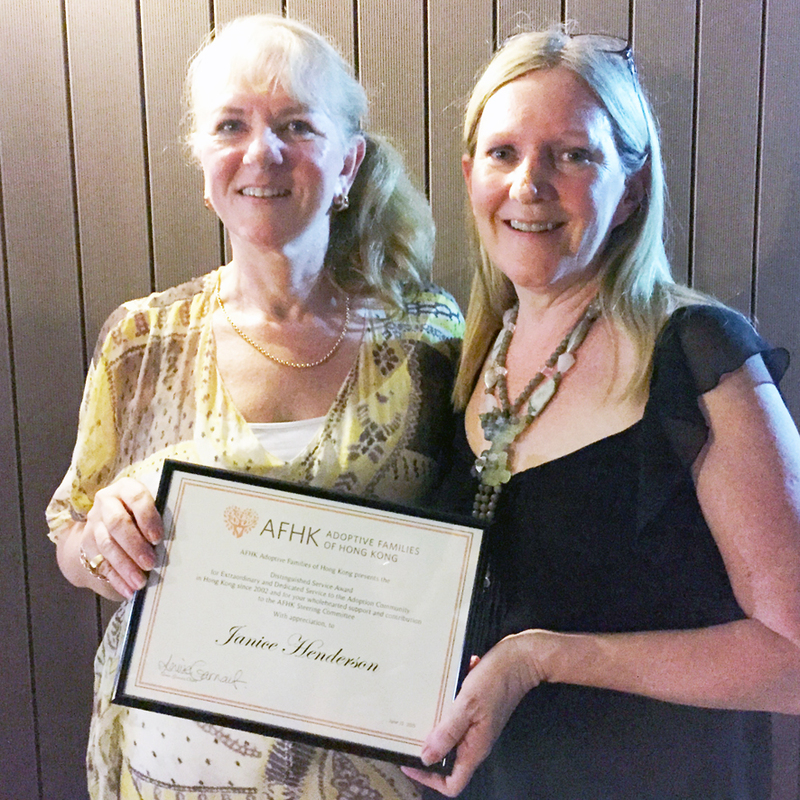 Congratulations to Jan Henderson for receiving the AFHK Distinguished Service Award for her commitment and dedication to AFHK and to helping adoptive families in Hong Kong since 2002. Jan will continue to work with AFHK as our joint Single Adoptive Parents Event Coordinator. 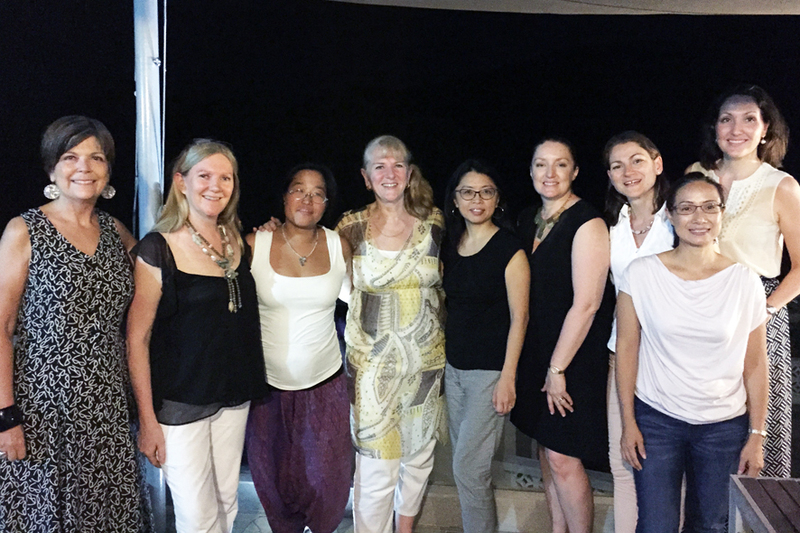 On Saturday 13th June 2015, our Chair, Louise Garnaut, hosted a lovely evening to congratulate Jan on her amazing service to AFHK and to bring the Steering Committee together to reflect and discuss AFHK’s work. Children can often express their thoughts better through play and reading books. 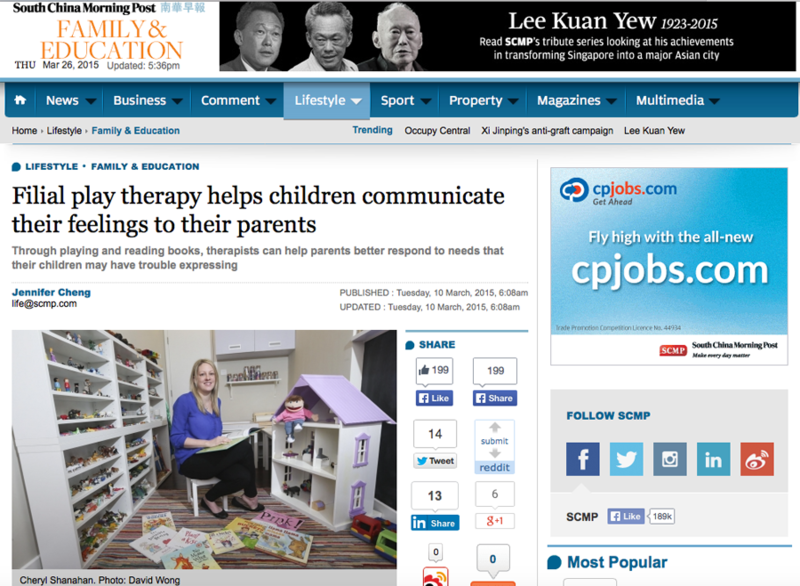 If you missed the presentation that Cheryl Shanahan did for AFHK in January on promoting resilience in children through storybooks, read about it and filial play therapy in this SCMP article. We are delighted to have Mary Wu from Mother's Choice Pregnant Girls Service join us for our Monthly Discussion on March 13. Don't miss the discussion ! Register online now.